Amanda was born in Johannesburg, South Africa, where she obtained her degree in architecture. Since then, she has worked as a licensed architect in the UK and New York. However, after moving to Connecticut she has primarily focused on her ceramic work refining the unique techniques she uses. Her training as an architect can be seen throughout her various ceramic pieces, where she plays with form and space in often unusual ways. The bulk of her work is composed of porcelain, stoneware, and raku clay; each with unique blends of glazes which result in a dynamic hue and tone. Through the use of different firing techniques, including Japanese raku, every piece is unpredictably and delightfully unique. Raku is a technique that has its origins in 16th century Japan; unlike other firing techniques where the pieces are put in a cold kiln and then slowly fired, these raku pieces they are unloaded from a hot kiln, when thermal shock then occurs; creating crackles in the glaze while it cools. Traditional raku and modern raku techniques are similar, but primarily differ during post firing processes, with modern pieces these are used to create unique effects and surfaces on the ceramics. Amanda's work is beautiful to look at but also functional as well; her pieces are intended to be used, enjoyed, and nurtured so they bring comfort and pleasure always. 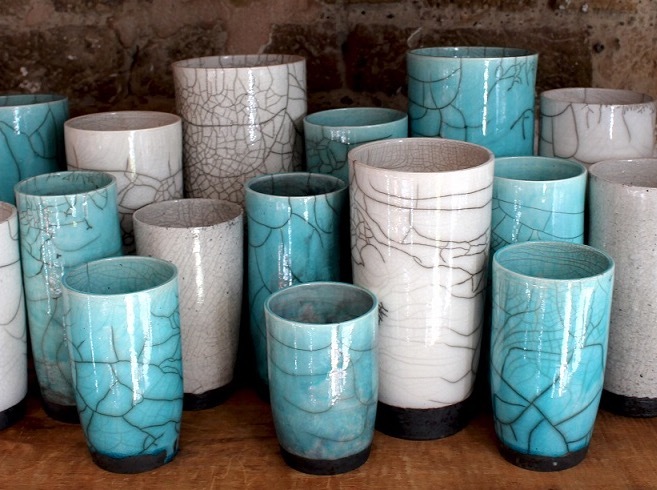 Available in turquoise and natural, these raku pieces are available in London, New York, Los Angeles and Chicago.